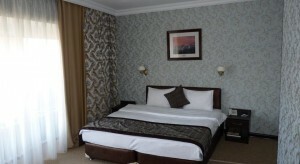 Located in Samal district of Almaty, just a 15-minute walk to the Kok-Tobe Mountain, Premier Alatau Hotel offers comfortable room with free Wi-Fi. Abay Metro Station is a 30-minute walk away. The modern rooms are air conditioned and come with a balcony and satellite TV. The private bathrooms offer a bath or shower and free toiletries. Various cafes and shops are a 10-minute walk from Hotel Premier Alatau. Kok Tobe Tower is 1.6 miles away. The distance to Medeo skating rink is 13 km, and Chimbulak Ski Resort is 11.8 miles from the hotel. Almaty-2 Train Station is 4 miles from the hotel. Almaty Airport is 10.6 miles away.